We drove from Fort Stockton, Texas to Las Vegas, New Mexico today. We stopped in Roswell, NM, best known for its obsession with unidentified flying objects. 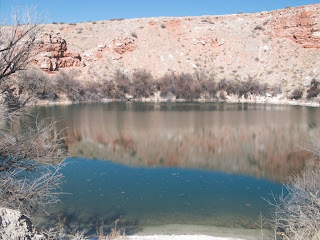 Nearby were two sites of interest to us … Bottomless Lakes State Park where we get out and stretch our legs with a good brisk hike. This place is known for its small lakes, which are actually water filled sinkholes (17 to 90 feet deep). 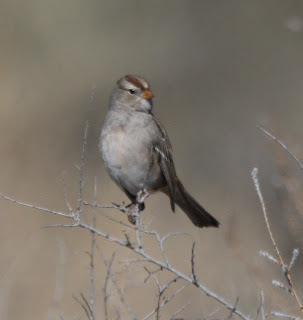 There were lots of White-crowned Sparrows flitting about and some waterfowl on some of the larger lakes. Our highlight bird was a Clark’s Grebe on Lea Lake. We also stopped in at Bitter Lake National Wildlife Refuge. The birding was pretty slow here, but we met the manager of Las Vegas National Wildlife Refuge who was here visiting for the day. He told us that they still had thousands of Snow and Ross’s Geese at his reserve and that we’d likely be there all by ourselves to watch them fly away in the morning! 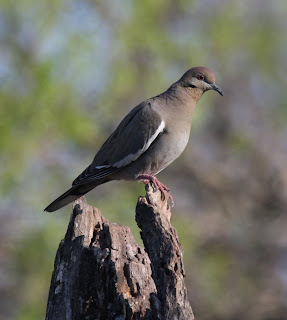 We were down at the river by Salineno by daybreak hoping to see Red-billed Pigeons, which are only seen as far north as the Rio Grande. 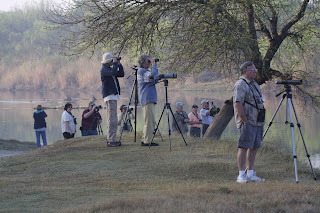 There were two other birders already waiting and as the mist burned off and the sun came up more people showed up! At around 7:30 AM, the birds showed up on a towering snag on an island upstream. They were there for about 10 minutes before they disappeared from view. 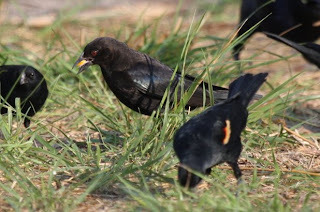 We again visited the feeders at Salineno and saw our first Bronzed Cowbird amongst the numerous Red-winged Blackbirds. 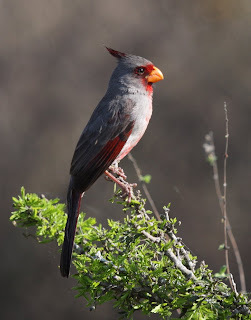 It was easiest to find by scanning through the flock in search of a ruby-eyed bird! The keeper here said that the birds have dropped off a lot in the past few weeks, but that there was at least one representative of each of the normal species found here. 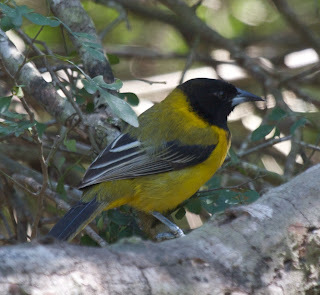 Only one Hooded Oriole was making an appearance anymore and he was only showing up 2-3 times per day. Our time for this trip is running out and so we moved on without waiting for him. 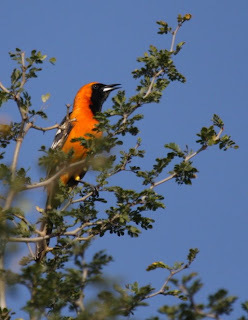 As we headed out and drove through the small town, Marcel noted an oriole in a tree and on quick inspection called out …. 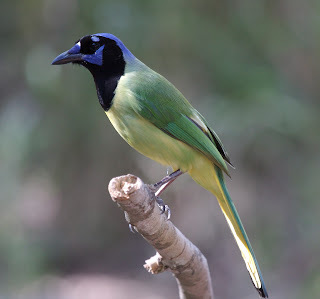 Hooded Oriole! It was in a tree out in front of a house and we all got a great look at this stunning bird! 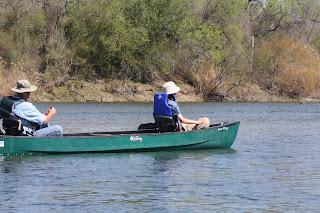 Upstream at Falcon Dam State Park presented a whole suite of new birds. It was past prime birding time, as the quail species had already taken cover for the late morning. 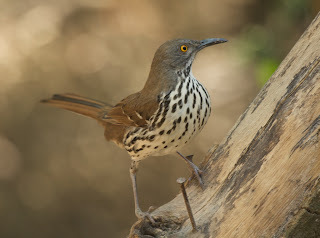 We did see a lot of Greater Roadrunners, Pyrrhuloxia, a few Cactus Wrens, Curve-billed Thrashers, and Chihuahuan Ravens. 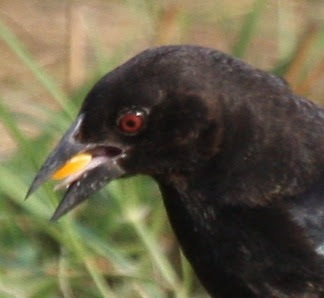 As we drive north in a serious attempt to put miles behind us, we continued to see some Crested Caracaras and Harris’s Hawks. By dark we were off the Rio Grande Valley in Fort Stockton, TX. We got up at 5 AM this morning to walk out and head over to Anzalduas County Park for a morning raptor watch. On our way out we passed a couple of the harder core owlers hoping to hear their first Elf Owl of the year. 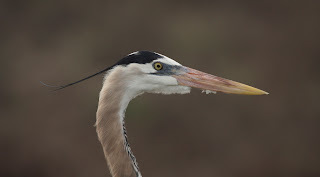 By the time we got to the parking lot, the Gambill’s (a couple of birders in their eighties) were getting ready to do their almost daily morning walk into the park. They informed us that the park we were headed for doesn’t open until 8:30 AM! We stood there all bleary eyed wondering what to do! Marcel and Dad stayed at the car for a while and had some breakfast. Joel and Mom went walking to listen for owls and eventually met up with the Gambill’s, who kindly let them tag along. They heard the Eastern Screech again, and got some nice lessons on some of the other birds calling including a nesting pair of Gray Hawks! By the time they got back to camp, tents and gear were almost all packed up. At Anzalduas, the Gambel’s had told us that a Hook-billed Kite comes across the river from Mexico at 9:45 AM! At 9:40 AM, five minutes early, there it was! We spent the afternoon canoeing on the Rio Grande up river from Roma with a World Birding Center trip. Highlights were Gray Hawk, Green Kingfisher, Ringed Kingfisher, and Muscovy Duck! After taking out, we all spent a bit of time enjoying the feeders at Salineno before heading back to Roma where we spent the night. We awoke today to the sound of a Ferrugious Pygmy Owl! 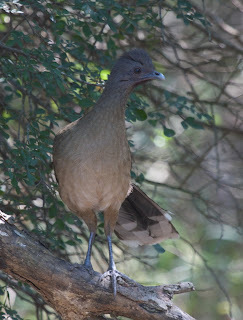 Shortly after, a group of Chachalaca began their chattering chorus. When the sky began to lighten, there was a whole symphony of different birds …. Northern Cardinal, Green Jay, Golden-fronted Woodpecker, Great-tailed Grackle, Northern Mockingbird, etc.! We spent the morning hiking and birding around the park. Down on the Rio Grande, we spotted a gorgeous Ringed Kingfisher on the Mexican shore, which eventually launched off and flew straight up the middle of the river and disappeared. 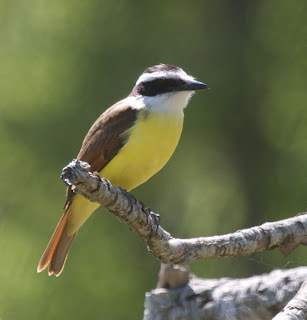 At the Kiskadee Blind we saw a Indigo Bunting, Green Jays, and the other typical feeder birds for this area. On our way out of the park for the afternoon, we stopped at the gate to watch for Clay-colored Robins, and we weren't disappointed! 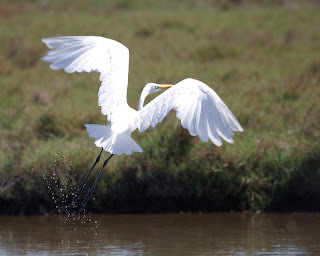 We spent the afternoon at Santa Ana National Wildlife Refuge. 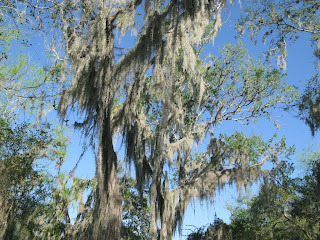 We walked different trails, saw a very large Texas Indigo Snake (longest snake in the US) and Texas Spiny-backed Lizards, and enjoyed the Spanish Moss covered trees! 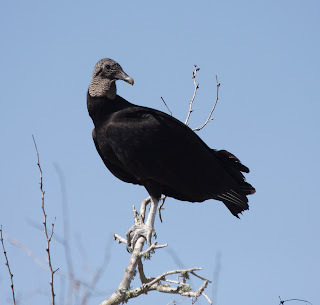 Along the Rio Grande about 30 Turkey Vultures were roosting in trees on the opposite shore. Periodically, they would rise up, circle, and settle in again. 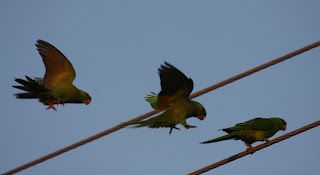 On our way back to Bentsen-Rio Grande, we looked for Green Parakeets (life bird #400 for Marcel) in McAllen. We got pretty turned around, but eventually found them staging as the light began to dim. There were hundreds of them on the power lines and even more of them arriving. There calling was deafening! We also noticed a few Red-Crowned Parrots flying over. We’re back at Estero Llano Grande for our morning birdwalk with Huck. 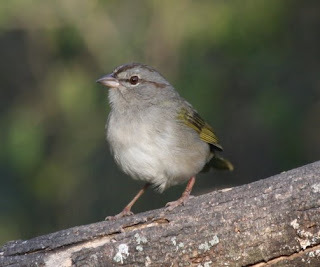 We did see the Rose-throated Becard today, as well as a Tropical Parula, and some other more typical birds. 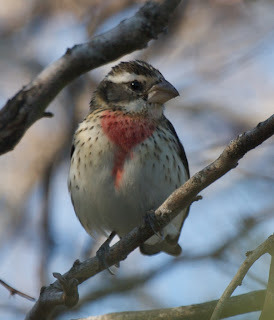 Mid-day we birded Frontera Audubon Sanctuary where we spent most of our time waiting for a Crimson-collared Grosbeak to make her appearance. 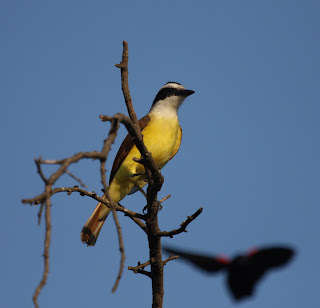 It was very hot and humid and hunger finally drove us onward without seeing this rare bird. By evening, we have our tents set up in Bentsen-Rio Grande Valley State Park. The only way into this primitive campsite is by foot or by a tram that can drop you in the general vicinity. As it was getting dark, we joined a guided nighttime wildlife watch. The trip began right outside our campground where the group was looking at an Eastern Screech Owl in a snag. Since this trip is booked up for a good month in advance and the van was full, we were invited to hurry along with another family by foot. At their next stop, they actually couldn’t get the van door open, and the “older” people inside had to climb out over the back and front seats to get out. Carol Navarro, the park ranger, ended up going back to headquarters to exchange the van for a tram. This was a turn of good luck for us and for the other family, because now there was room for all of us! Jim, our other guide, stayed with us and pointed out a distant Great Horned Owl. When Carol got back with the tram, we all loaded up and continued on. We used a “bat box” which picked up bat radar. When we heard a bat flying over, a light was shined up and we’d catch a glimpse of a Mexican Free-tailed Bat flying by. Walking down the dark roads, a flashlight beam would catch the orange eyeshine of Common Pauraques. Down near a resaca, we heard the sound of amphibians and one of the sounds was new to the park folks. They were thinking that maybe the native Cane Toad had made its way here. In a grassy area, Carol showed us how to find spiders by putting a light up next to our eye. The light reflects off the eight eyes of the spiders. Indeed that works and the grass lit up! It looked like someone had tossed a handful of small diamonds out in front of us. If you follow the sparkle to its source, there you’d find a spider! With a black light bulb in a small flashlight, scorpions showed up as glow in the dark figures in crevasses. Joel found a leafcutter ant trail and we watched the ants as they stripped the leaves off a tree and carried them off down a trail and down into the ground to their underground farm. Carol told us that they compost these leaves to make fungus. They actually eat the fungus, not the leaves. People often mistake these leafcutters for fire ants and unfortunately destroy them. After 3 ½ or so hours of this fun, we went back to camp, crawled into our tents, and fell asleep to the sounds of crickets, the Eastern Screech Owl, and Common Paraque. This morning we essentially get a private tour of Estero Llano Grande State Park by Jonathon, a volunteer. We learn all about the history of this place. Just a few short years ago this land was converted from cotton and cornfields to very productive wildlife habitat. Shallow ponds were dug into the earth and the land was vegetated with native plants. It is a highly managed landscape with irrigation water filling these man-made water features and much effort spent trying to keep exotic plants in control. 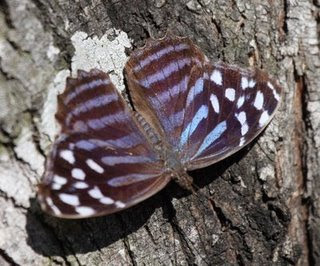 There is a butterfly garden where we saw Mexican Bluewing, Giant Swallowtail, Soldier Monarch, Mexican Spotted, and Pipe-vine Swallowtail butterflies. 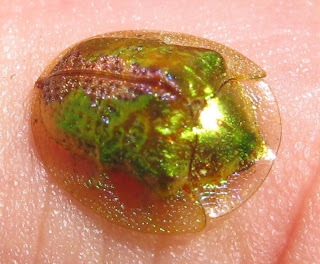 We also saw this really cool beetle, an iridescent tortoise beetle. 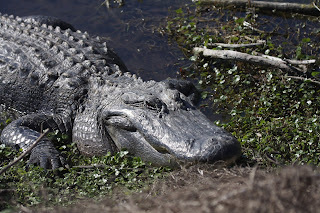 There is only one natural pond here (Alligator Pond), which is quite deep and harbors large alligators. 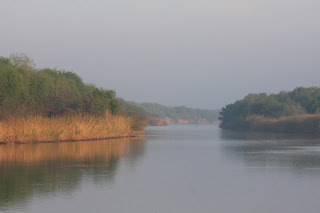 There is also a water filled resaca, which is an old oxbow (river channel) of the Rio Grande. Between these natural features and the created habitat, the park has drawn in a lot of great wildlife. Jonathon takes us through an old trailer park, which is being disassembled and is a restricted area, as there are lots of open cisterns and other hazards. 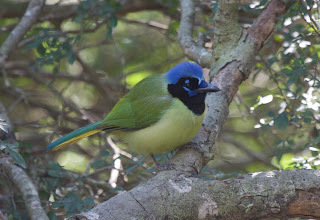 Currently this area has some great rarities … a Black-throated Magpie Jay (probably an escapee from captivity), Blue Bunting, and a Rose-throated Becard. We didn’t end up seeing any of those birds by the time our tour was up, and so we decided to go have lunch and do an afternoon birdwalk. 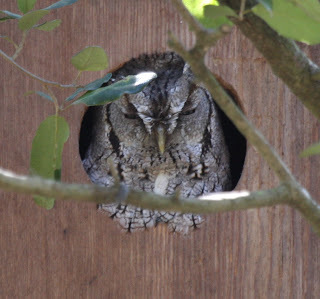 Because our group had been so small, Jonathon was able to show us an Eastern Screech Owl peering out of a nest box! The afternoon birdwalk was led by a 4 year, very committed volunteer named Huck. 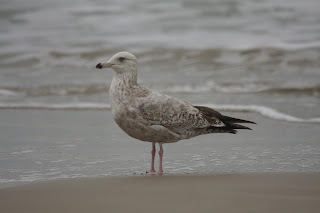 Again, we missed seeing the rarities, but saw a lot of other great birds. After the tour was over, Huck continued on and took us out to see Common Pauraque by Alligator Lake where we also saw Green Kingfishers and Anhinga. 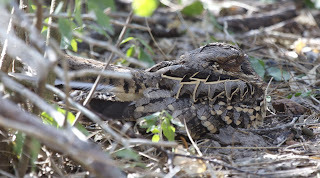 The Common Pauraque was just a few feet off the trail in its reliable roosting spot on the ground. It camoflagues so well, that you’d unlikely find it on your own! Huck said that if we wanted to come back in the morning, he’d lead an 8:30 AM walk through the trailer park to try again for the rarities. 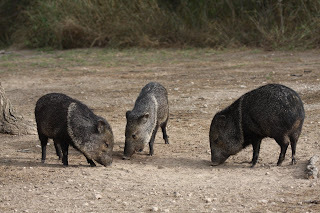 Estero Llano Grande State Park really made us realize that we can do more to improve the habitat around our home. We are about as far south as you can be in Texas. 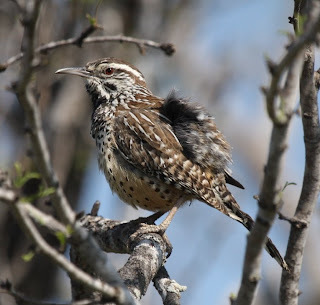 Here we begin to see some birds that reach their northern most range in Texas and are endemic to this area. 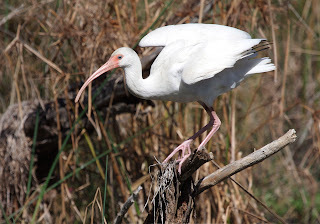 Sabal Palm Audubon Center sits at the southern tip of Texas near the mouth of the Rio Grande. This is where we started our day. 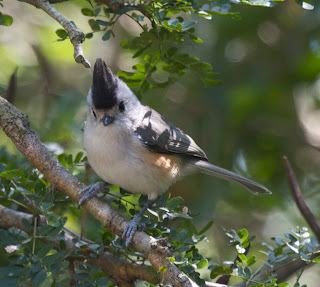 On our “most-wanted” list, Green Jay and Plain Chachalaca ranked highest with Black-crested Titmouse, Great Kiskadee, and Olive Sparrow not far behind. 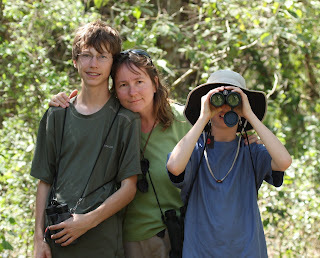 At Sabal Palm, we saw these long awaited species plus some others. 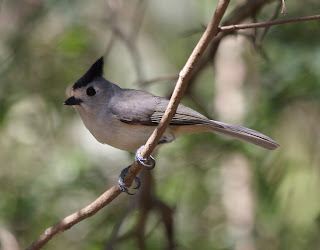 Within the first five minutes of being there, we had seen Green Jays, Plain Chachalacas, Black-crested Titmice, White-tipped Doves, and an Audubon’s Oriole. 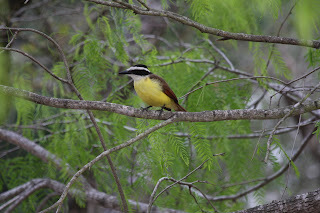 On the Resaca Loop Trail, we found a Great Kiskadee and two Olive Sparrows. 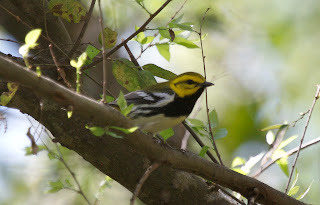 Off Vireo Lane, we saw one Blue-headed Vireo and some very nice warblers – Yellow-rumped, Black-throated Green, Yellow-throated, and Orange-crowned. 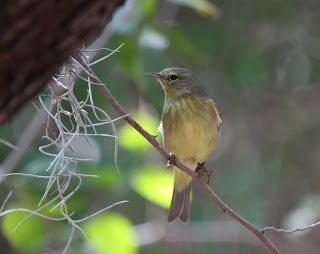 In the Butterfly Garden, we found a Dusky-capped Flycatcher, generally found only in southeastern Arizona and extreme southwestern New Mexico. This bird has been frequenting Sabal Palm for a couple of months. Along the Rio Grande, we saw our first Buff-bellied Hummingbird, which was visiting a flowering bush. At mid-day, we spent an hour exploring the Laguna Madre Nature Trail on South Padre Island. Joel got a quick glimpse of a Clapper Rail, while most of us only heard it. 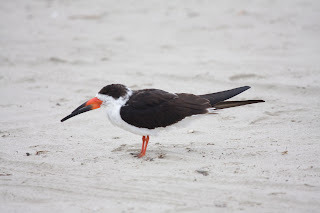 We especially enjoyed watching Black Skimmers, two Marbled Godwits, and a Caspian Terns on the shore and on the wing. We finished our day at Laguna Atascosa National Wildlife Reserve. The trails around the visitor’s center were notably busy with birds. 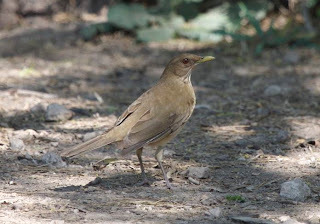 Along with numerous Green Jays, Long-billed Thrashers, Red-winged Blackbirds, Plain Chachalacas, and Great-tailed Grackles was an immature male Rose-breasted Grosbeak and some harder to spot warblers flitting about. 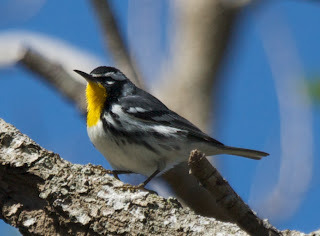 We found both Tropical and Northern Parulas, a Wilson’s, four Orange-crowned, and the usual plentiful Yellow-rumped Warblers. During the last magical hour of light, we drove the sanctuary loop. 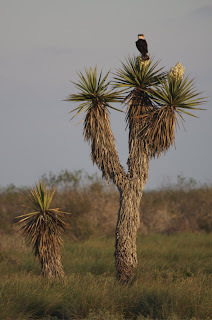 We saw no Ocelots, but were treated to lots of shorebirds and ducks, some Couch’s Kingbirds, and a gorgeous Crested Caracara perched on a tall Yucca-type tree. Today we birded two of the Texas barrier islands, Mustang and Padre. After the short ferry ride from Aransas Pass to Port Aransas, we visited Paradise Pond, a small, dried-up lake around the corner from the ferry landing. 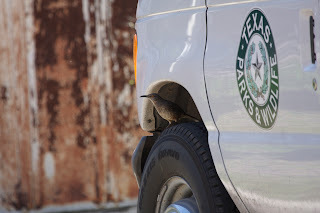 There were tons of Yellow-rumped Warblers, a few Lincoln's Sparrows, a couple of Northern Mockingbirds, and we even got a couple of looks at a very elusive Winter Wren! 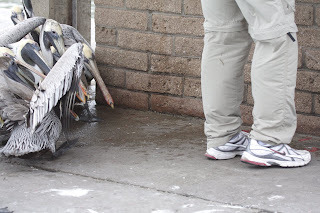 At the Port Aransas Birding Center, the birds were more active. Yellow-rumped Warblers lined the path leading to the lake, which had quite a bit of water in it, where we were greeted by a Tricolored Heron, Neotropic Cormorants, and Brown Pelicans. Out on the lake, we found all three species of teal, Ruddy Duck, and American White Pelican. In the air, Roseate Spoonbills, Caspian and Common Terns flew by. And in the depths of the marsh, rails lurked. 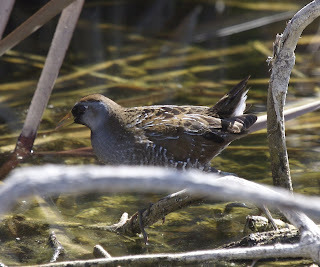 We saw a Sora and two King Rails, which are even more elusive than the Winter Wren! 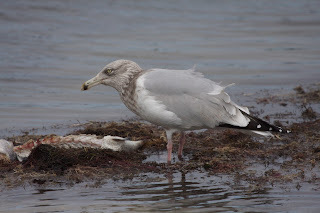 At Mustang Island State Park we didn't see many birds except for Laughing Gulls, Black Skimmers, and Ring-billed and Herring Gulls, but we still went out to the end of the jetty to see if we could spot Northern Gannets. I (Marcel) got thoroughly soaked by a wave that washed over the jetty, and we didn't see any gannets. The Padre Island National Seashore was much more productive. 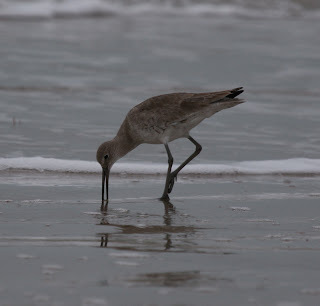 Among the highlights were Sanderlings, a Piping Plover, and some Willets. At the visitor center we learned about how the ocean currents dump everybody's trash from all around the Gulf Coast and beyond right on the the Padre Island beaches. Even a helium balloon released from the mid-west will find its way to their beaches! We crossed over to Corpus Christi and continued southward to Highway 185, dubbed Hawk Alley by the local birders for obvious reasons. As the light began to fade on our day, we spotted many Harris's Hawks and a number of Crested Caracaras. We were back at Aransas this morning walking the Rail and Heron Flats Trails. Large and small alligators basking in the sun were plentiful. New life birds were Swamp Sparrow and Least Grebe. We also had a great show around a roadkill pig where Black Vultures were having a pork feast. Crested Caracaras, a family favorite scavenger, was also seen flying the skies today. We heard rails, but the only one that was actually seen was a Sora spotted by Joel. 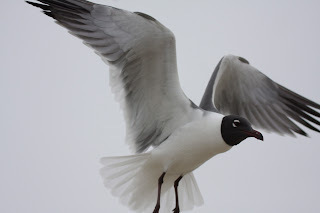 At Goose Island State Park we visited a couple of campsites with feeders and a drip. 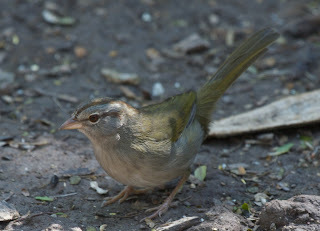 Highlights included a Hermit Thrush and our first ever Clay-colored Sparrow. 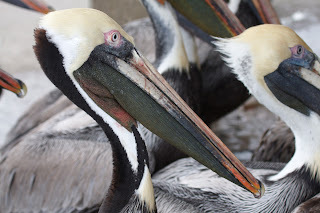 Down at the fishing dock, we witnessed a pelican feeding frenzy. 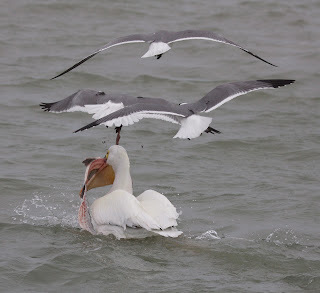 Fishermen were cleaning fish and the Brown and American White Pelicans were feasting! 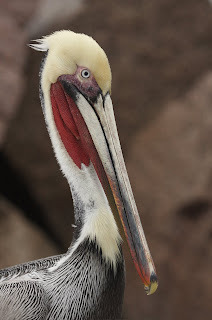 The Brown Pelicans are especially habituated to humans and this easy source of food. The fishermen even gave us four fillets of Black Drum fish for our own meal and it was TASTY! That made for feast number three!